Meet Louise Neal in the BFC parking lot by 9 AM tomorrow (Saturday, September 8) to ride BART from North Berkeley to the Embarcadero to participate in Faiths Rise for Climate, Jobs and Justice. Monthly Business Meeting and Potluck Luncheon is next Sunday, September 16. Please bring a dish with food in it or be prepared to contribute $3.00 for supplies. We need a diversity of salads, casseroles, fruit, breads, etc. Be creative! The Solano Stroll is this Sunday, September 9. We are staffing a booth to promote the Food Pantry and to let people know about BFC. Please drop by for a visit. BFC’s booth is on the south side of Solano Avenue, roughly midway between Santa Fe Avenue and Curtis Street. The next quarterly gathering of the Christian Friends Conference—Western Region will be held 9 AM – 3:30 PM on Saturday, September 15, here at BFC. You are invited to take part in waiting worship and Bible reading in the manner of Conservative Friends, and to share fellowship and an open discussion with Christian Quakers from around the Bay Area and beyond. Beverages and bagels will be provided in the morning; please bring your own lunch. 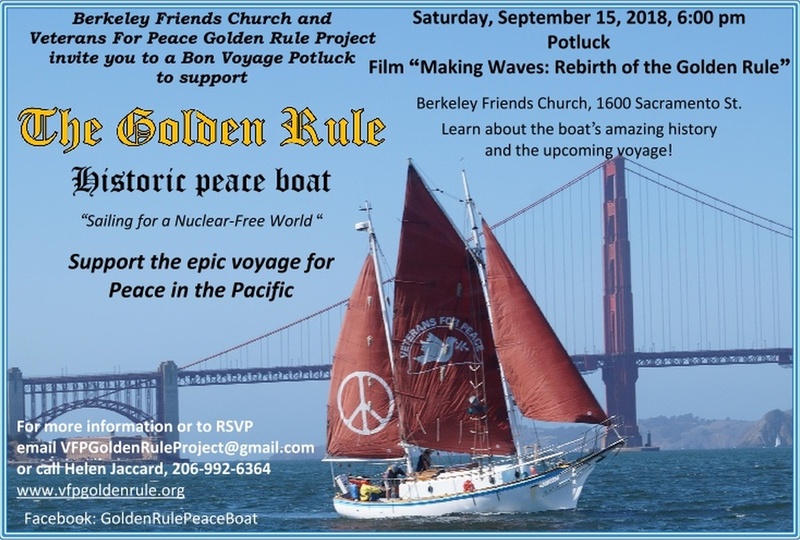 The Golden Rule, a historic peace boat, dedicated to “sailing for a nuclear free world,” is coming to town. Come to Berkeley Friends Church, Saturday, September 15 at 6:00 PM to share a potluck, see a documentary film, and learn how you can support the project. Rides on the sailboat are available from the Berkeley Marina on Sunday, September 16 at 2:00 or 4:00 PM. Email Helen Jaccard at [email protected] to reserve a place. Sanctuary Bistro’s benefit dinner for the Berkeley Food Pantry will be on Sunday, September 16 with dinner service from 5:30 PM to 9:00 PM. Sanctuary Bistro will donate 30% of its profits from the dinner to the Berkeley Food Pantry, so let’s pack the restaurant! Those interested must call Sanctuary Bistro at (510) 558-3381 to make reservations. Sanctuary Bistro is a family-run vegan restaurant located at 1019 Camelia Street, Berkeley, Ca. 94710. Now that Micah Bales and Faith Kelley have accepted our call to be co-pastors of Berkeley Friends Church, everyone is encouraged to read Micah’s blog. Micah welcomes phone calls: see Tomi! Micah and Faith plan to submit an insert for our bulletin each month until their arrival in Berkeley in 2019.